We had so much fun this past December, hosting our 5th annual Open House for our 150 couples marrying at Serendipity this year! We had some very interesting and exciting vendors participate. It ranged from rehearsal dinner options to live musicians and baked goods! Our couples received some adorable tote bags filled with goodies and information about the event. 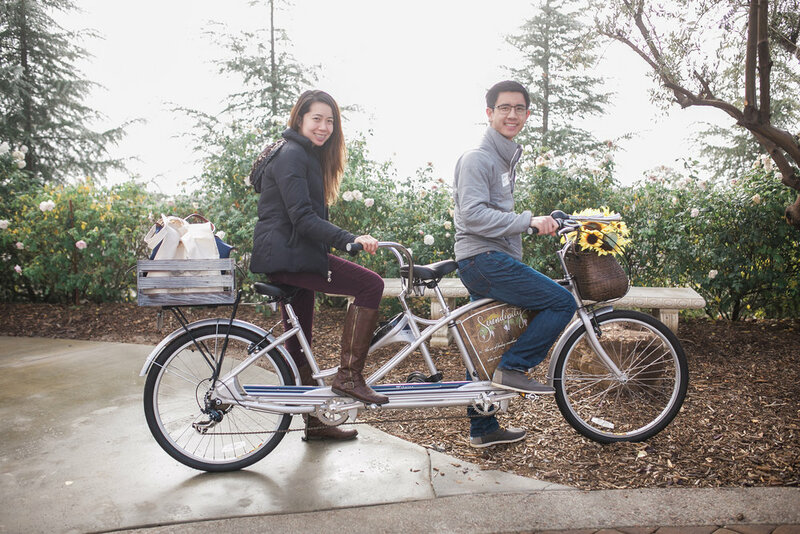 Additionally, we arranged for each couple to take photos on our gorgeously decorated bike. They also had a chance to tour our beautiful Cottage A'more, taste our deliciously prepared grilled dinner menu and meet and greet some of our preferred vendors! We also had some raffles for our couples that included a free engagement cake from Michelle's Bakery, an engagement session from Camarie Photography and so much more. Congratulations to all of our couples that won! The Olivine Collective provided all of the decor for our Open House. This included the incredible sweetheart table, lanterns and so much more. Flowers ETC. provided the elegant floral arrangments at every table. Sifted By Cyndi provided the amazing dessert display using Olivine Collective's service pieces. Their delectable sweets were available to all of our couples. The vendors mentioned above are some of our favorites! There was also much chatter about our barn and when it will become available for weddings. Trust us, we are working diligently to get this amazing structure up and running for our couples! Overall, our Open House was, yet again, very successful and so much fun! We hope you enjoy some of the photos we have included below! A huge THANK YOU to all of our vendors who attended our 5th annual Open House! We hope you enjoy our wonderful vendors below.